According to Nobel Prize Laureate Carlo Rubbia, living things are only one billionth physical matter. The rest, he says, is energy! That goes for your body as well. When it comes to breast cancer prevention and breast health, it is vital that you keep your energy, or Qi, flowing. Louis Hay, author of the best-selling book You Can Heal Your Life, presents one interpretation of this connection: “When there are problems with the breasts, it usually means we are ‘over mothering’ either a person, a place, or a thing, or an experience… If cancer is involved, then there is also deep resentment.” Other emotional blocks include lack of self-love and lack of nurturing in one’s life. Of course, this is a modern translation of the words of this ancient text as there was no such thing as the current concept of cancer back then. It is safe to say, however, that throughout history people have seen the consequences of blocked Qi. The development of “blocks in the river,” or tumors are a result. The point on the feet that connects to the breasts is a rectangle-shaped area on the top of the foot that extends “from the base of your toe to slightly below your big toe knuckle.” To massage the area, Tsu suggests making a fist and using all of the knuckles to rub up and down with moderate pressure for 30-60 seconds. 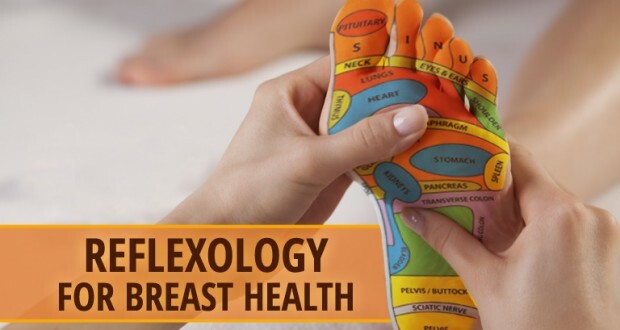 Massaging reflexology points that are connected to the lymph glands is beneficial as well, since the breast area contains a large number of lymph nodes. Keeping the body systems in flow through the use of ancient Chinese medicine techniques like reflexology is a vital part of “The 7 Essentials System™” for healing the body naturally and a time-tested way to stay vibrant, vital and dis-ease free.